"A pathway to a golden new feature in your life mixed with bad advice and mystical bull…"
Read that? There I just saved you 224 pages and 16.29 bucks cause that is the amount of goodness in this whole thing. 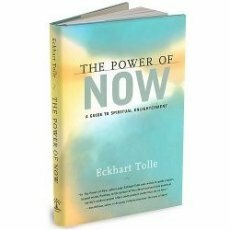 Basically Tolle picked up a bit of something developed and perfected in the east (specifically in Buddhism and Hinduism) and talks about it like it just came to him in an epiphany. The truth is mindfulness meditation has been around for centuries and even in the western world there has been wide acceptance of the psychological advantages of it at least 10 years before Tolle. The problem is not only does Tolle not acknowledge the true experts in this field; he also doesn’t go that deeply into specific practical techniques to achieve this state of mind. And when he starts to diverge from mindfulness meditation, that’s when it gets plain bad. Not only will he give the usual meaningless incomprehensible and confusing mystical babble that will only distract you from the good part; he will plain and simply give you bad advice concerning the search for happiness, like saying that belief that you control your life is an illusion that brings pain. This goes complete in opposition to the proven concept of Self-Efficacy from positive psychology (which is one of main academic sources for dating skills research by the way); which posits that one of the important factors to happiness is the belief that one as the capacity to complete tasks and achieve goals. He also makes a bogeyman out of your mind and thoughts which will probably just make you get stressed out like T0rch did. But on that topic I suggest you see S. A. Martin-Nunez’s review at Amazon, he also gives a list of more appropriate books if you are interested in this. But my suggestion (especially if you want to spare time and money) would be to check out the wiki page for “meditation” and “research on meditation” to get an overview of the types and benefits of meditation and choose which would be better for you; then just Google it and you will probably find good free advice on techniques to develop it. As for its [meditation (not this book)] applicability to dating skills I would say it is a titanic addition to your inner game (and also a good thing to show off knowledge about), but if you want specifics, you get (happiness, relaxation, emotional balance, self-esteem, reduced depression and anxiety which does wonders for those with approach anxiety; increase in, self-control, perceptual sensitivity and empathy which in turn leads to greater social intelligence and also increase in awareness which help pick up the subtle cues of the social world not to mention a diminished need for sleep which gives you more time to game. This is of course not mentioning all the health and intelligence boosts. (And yes all of these benefits have been scientifically documented). I would probably define myself similarly to him but you have to keep an open mind especially for eastern stuff; yes they often babble with mystical hocus pocus, but sometimes there is truth in their teachings. What I suggest is you check what scientific research has come up about the subject you want to check out and then go on from there. Also they (eastern philosophers) often talk in hyperboles and parables so don’t take their words too seriously. Yes you are your mind but what he meant is you are not your current thoughts so don’t give them too much credit. This book goes so far beyond the western applications of mindfulness, it's no comparison actually. Our version of mindfulness is a very effective psychological tool, but has nothing to do with mature spirituality. It was also not ment to be so. And like true buddhist mindfulness Tolle is not about being in a specific state of mind . There's a world of difference between doing/ practicing specific meditation techniques and the natural state of meditative awareness. There are a lot of eastern philosophers,but that's not the eastern counterparts of Tolle, no stories or parables there .They're just to attract people to the real teaching,people that can 'taste'the truth and forget about just listening to stories.